What is a Respiratory Allergy Panel? Ah, spring. It’s finally warm again after a long, hard winter. The perfect time to get outside for long walks in the neighborhood, hikes in the hills, or soaking up the sun on your favorite rooftop. But that “ah” can quickly become “ah-choo” if you’re one of the 36 million Americans with allergy problems. The runny nose, itchy eyes, and congestion – all typical respiratory allergy symptoms – can slow you down and make you miserable. Each type of IgE has a specific “radar” of sorts for each type of allergen. That’s why some people are only allergic to one thing, while others have allergic reactions to multiple allergens, because they have many more IgE antibodies. A Respiratory Allergy Panel is a blood test that measures levels of sensitivity to various substances found in the environment. 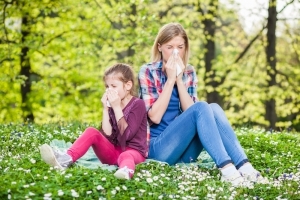 Allergies are made up of a number of conditions that are caused by hypersensitivity of the immune system to something in the environment that usually causes little problems in most other people. This blood test measures the presence of IgE antibodies to specific environmental allergens. IgE is the antibody that triggers environmental allergy symptoms, which can range from airway constriction to dizziness or lightheadedness. What does a Respiratory Allergy Panel include? Cat and dog dander allergy. Ragweed, ash tree, birch tree, cottonwood tree, elm tree, bermuda grass, orchard grass, timothy grass, maple tree, walnut tree, mulberry, and many more. For many people, avoiding allergens and taking over-the-counter medications is enough to ease symptoms. But if your allergies are still bothersome, don’t give up. A number of other treatments are available and you should consult your doctor for further advice.